کشاورزی شهرستان تربت‌حیدریه با توجه به امکانات و پتانسیل‌های موجود در زمینه منابع مختلف کشاورزی از امکانات ویژه‌ای برای کشت زعفران برخوردار است. در تحقیق حاضر با استفاده از اطلاعات جمع‌آوری‌شده از جهاد کشاورزی استان خراسان رضوی و سالنامه آمار بازرگانی خارجی برای سال زراعی 92-91 به بررسی مزیت نسبی تولید زعفران در شهرستان تربت‌حیدریه با استفاده از شاخص DRC و ماتریس تحلیل سیاسی PAM و در ادامه به بررسی مزیت نسبی صادرات زعفران پرداخته شد که به این منظور از شاخص‌های مزیت نسبی آشکارشده (RCA) و مزیت نسبی آشکارشده متقارن (RSCA) استفاده گردید. نتایج نشان‌داد شهرستان تربت‌حیدریه در تولید زعفران دارای مزیت نسبی است. همچنین بر طبق شاخص NPC قیمت بازاری محصول بیش از قیمت سایه‌ای آن است و لذا تولیدکننده از یارانه بهره برده است و از بازار محصول حمایت می‌شود. بر طبق معیار EPC نیز مداخله‌های دولت به سود تولید این محصول عمل کرده است و درمجموع از بازار نهاده و محصول حمایت می‌شود. درنهایت سودآوری خالص اجتماعی نیز در همه حالات مثبت می‌باشد. همچنین بر طبق هر دو معیار مزیت نسبی صادرات در سال‌های 2012-2004 کشورهای ایران، اسپانیا و یونان به ترتیب دارای اولویت مزیت نسبی صادرات در جهان می‌باشند درحالی‌که صادرات زعفران ایران ارزش‌افزوده بالایی ندارد لذا در راستای بهبود وضعیت کنونی، پیوستن به سازمان تجارت جهانی جهت کاهش تعرفه‌های صادرات، توجه به بازاریابی محصول و ارائه تسهیلات لازم ازجمله حمایت‌های ارزی پیشنهاد می‌شود. With due attention to facilities, and different potentials and sources in agriculture of Torbat Heydarieh city, this region is suitable for cultivation and production of saffron. In this study comparative advantage of saffron production in Torbat Heydarieh investigated using DRC index and policy analysis matrix (PAM) during 2012-13. Also in this study evaluated comparative advantage of saffron export using RCA and RSCA index. The Results showed that saffron production in Torbat Heydarieh has a comparative advantage. According to the NPC price index is higher than market price and so producers benefited from subsidies and market support. According to the EPC standard, government interventions has a positive effect on production of this crop, so was supported from input and production markets this crop. In result, NSP index was positive in all sectors. Results of these two indexes showed that Iran, Spain and Greece had preferences on export relative advantage in the world during 2004-2012. While value added of Iran saffron export is not considerable, therefore, for improving this condition, joining Iran to the WTO in order to reduce tariffs on exports, paying more attention in marketing and supplying necessary facilities such as foreign exchange support in the country was suggested. Abedin, M., and Askari, M. 2005. Comparative advantage and prioritize target markets of honey export in Iran. Agricultural Economics and Development 13(50): 167-197 (In Persian with English Summary). Ayoola, O.T., and Makinde, E.A. 2007. Fertilizer treatment performance of cassava under two planting pattern in a cassava-based cropping system. Research Journal of Agriculture and Biological Sciences 3: 13-20. Azizi, H., and Yazdani, S. 2006. Survey of apple export market with emphasis export Comparative advantage. Research and Development 73: 145-155. Fung, G. 2004. The average and marginal domestic resource cost of foreign exchange. Oxford Economic Papers 47: 675-663. Haji Rahimi, M. 1997. Economic incentives and comparative advantage in agricultural production in the Fars province. Master Thesis, Shiraz University (In Persian with English Summary). Huang, J., Song, J., Qiao, F., and Fuglie, O. 2003. Sweetpotato in china: Economic aspect and utilization in pig production. International Potato Center (IPC). Bogor, Indonesia. Lagos. G.e., Mardones, F. 2003. Development domestic resource cost approach to identify the economic and environmental impact of trade: The mining sector of Chile, Catholic University of Chile Santiago. Ministry of Agriculture Jihad. 2013. The MAJ Database. Available at Web site http://www.maj.ir. (verified 5 November 2013). Mohamadi, D. 2004. Comparative advantage of oilseeds and survey difficulties of its production in Fars province. Agricultural Economics and Development 47: 125-140 (In Persian with English Summary). Nori, K. 2001. Comparative advantages of major groups of rice in the Gilan and Mazandaran. Agricultural Economics and Development 40: 25-46 (In Persian with English Summary). Page, G.M. 2002. Technical efficiency and economic performance: some evidence from Ghana, Oxford Economic Papers 32(2): 319-339. Saban, Y., Mehmt, A., and Mustafa, E. 2007. Identification of advantage of maize- legume intercropping over solitary cropping through competition indices in the esat mediterranean region. Turkish Journal of Agriculture 32: 111 – 119. Serin, V., and Civan, A. 2008. Revealed comparative advantage and competitiveness: A case study for turkey towards the EU. Journal of Economic and Social Research 10:25:41. Shahabuddin, Q., and Dorosh, P. 2002. comparative advantage in bangladesh crop production, International Food Policy Research Institute 47, Washington D.C.
Shahnoshi, N., Ghorbani, M., and Azarinfar, Y. 2007. Comparative advantage analysis of cereals in the khorasan province. 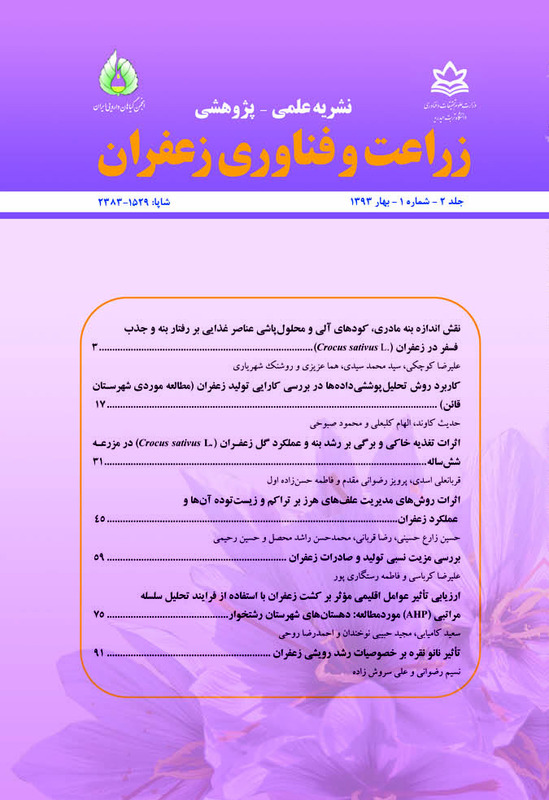 Journal of Agriculture and Natural Resources 14(4): 1-19 (In Persian with English Summary). Trade promotion organization of Iran. 2013. The TPO database. Available at Web site http://www.tpo.ir. (verified 1 March 2013). Warr, P. G. 2002. Domestic resource cost as an investment criterion. Oxford Economic Papers 35:302-306. Wurtenberger, L., Koellner, T., and Binder, C.R. 2006. Virtual land use and agricultural trade: Estimating environmental and socioeconomic impacts. Ecological Economics 57: 679-697. Zare, A. 2008. Comparative advantage of peanuts production in the Iran. Journal of Agricultural Science 18(2): 27-36 (In Persian with English Summary).